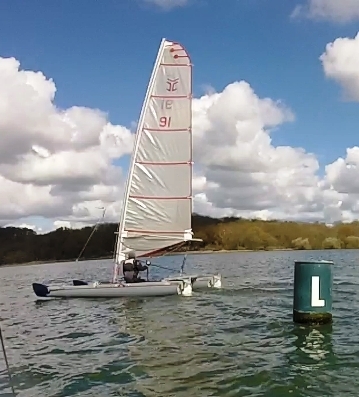 Catapult opened the 2016 TT series in fine style, hosted (for the first time as the season opener) at Rutland Sailing Club alongside the Squib Inland Championships (both fleets welcoming the triangle courses laid on by RSC. New members getting to grips with the boats boosted a good racing fleet. To say the least, conditions varied across the days (photos below) hopefully marking the change from winter (Saturday) to Spring on Sunday. Saturday brought chilly northerlies under cloud with a hint of sunshine, fluctuating moderate to fresh. The Club's port rounding triangular course, gave a broad run following the beat, and a tight lead to the downwind mark. At the Race One start, Alastair Forrest tightly defended the pin end from John Terry and Alex Montgomery, but Gareth Ede split off to the right on the beat to come through to lead at the top.There, the top mark revealed its crucial tactical place through the day, being shadowed close to the shore by trees, boats dying in the dead patch as they rounded. John Terry was the first to gybe and go sharply left (at right angles to the course) to pick up breeze and lead. On the next beat going out to the right quickly was the correct tactic; Gareth took the lead back, and George Evans came up to pressure Alex on the last beat, with John falling back to 4th. Race 2 kept the same course with the wind now lighter. John and Alex defended the pin end successfully but Stuart tacked early to go out to the right and effectively gained. The tactical difficulties were summed up at the top mark when Alex felt he had enough breeze to head directly away from the mark on starboard downwind with a big gain over John gybing left to chase pressure. Alex held the lead, gaining from a shift upwind, but Gareth, on his tail on the reach, snatched the lead gybing more tightly onto the final stretch for another win, with Stuart coming in 5th. As Race 3 got underway the dark clouds to the north rolled in with powerful gusts The start was won by Alex with an aggressive dive from up wind to nip into the gap left by John and Alastair easing up to the start, and climbing on trapeze he moved away, chased by Gareth spilling wind to survive. John Terry, getting on trapeze, saw the whitecaps coming under the cloud, concluding that it would not be survivable, while behind Chris Phillips was banged over by a gust (photo below, from Syd's on-board camera.) Behind the leaders, George Evans again relishing the stronger winds made a big gain in the third beat to take third. In spite of the strong breeze, the top mark remained a lottery, with no clear tactic coming into the dead space and climbing out of it, and Gareth gained behind Alex on the reach to the gybe mark. Alex tried to protect his position, by pushing him to windward as they overlapped, but Garethmomentarily slowed to duck behind and overtake to leeward for a slim lead to the finish. Sunday dawned very differently, still cold but with bright sunshine and a light north-west breeze. (Photo below) The Squibs and Catapults headed to the western end of the reservoir, where low-lying land made wind shadows less crucial at the top mark. The light breeze (due to shift west) fluctuated wildly in direction and strength so that tacking on the wind shifts became possible, while luck played a big part as a shift could gain or lose about many several places. For race 4 the start was heavily skewed to port and Stewart Ede picked this well to cross in front of the fleet to a good lead. He John, and Gareth battled for the front places, but on the second lap Stuart stayed well out to the left to be hit by a devastating shift, to drop way back, while Alex came through to lead. Alex led the last lap but on the final short beat to the line Gareth tacked early in a cheeky attempt to steal the win, which Alex just defended. Behind George pulled up on the beat for third, with Alastair behind. For race five on the same course the start stayed heavily port biased, and Stuart with a good start and Alistair crossed ahead of the fleet on port (photo above) only to look back and see the starboard end boats led by Alex getting a big shift and charging above them. Gareth caught a cracking patch of wind on the beat flying a hull while others were inching along, almost catching Alex. Stuart came back upwind to take and hold third. Ahead on the final run, on port Alex pushed Gareth way up to windward going left, with Gareth holding a small overlap, until they had to gybe onto starboard for the mark, giving Gareth the right of way. He rounded the mark first and dashed to the line for another of the tight finishes marking the weekend. Race 6 of the three back-to-back races the wind shifted further west with a course change and a starboard- favoured line. Wind-shifts taxed the fleet, with Alex and John moving out in front. On lap two, Syd used a big shift with good breeze to take just ahead of Alex and John, and these three ran side-by-side down to the wing mark. A detailed consultation amongst themselves on rules and tactics (mindful that collisions might lead to at least two 360's) made their rounding safe, to the disappointment of the pursuing group close behind, Alex just capturing another narrow finish, with John squeezing Syd into third. Behind Alastair welcomed a big shift to lift him to 4th chased by Stuart. Rutland also marked the first outing of John's HANDICAP RANKINGS. The event leaders above came through well, but Alastair scored well on handicap for age, of both boat and helm (in John's estimation) to take the win, below. He gains the right to fly the Red and Mauve flags at Bass at the Bank Holiday weekend.